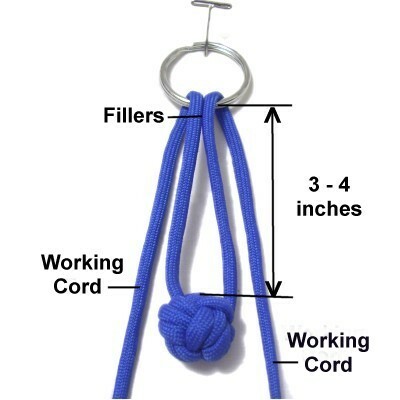 Description: This Monkey Key Chain features a unique decorative knot called the Monkey Fist, which looks like a ball. 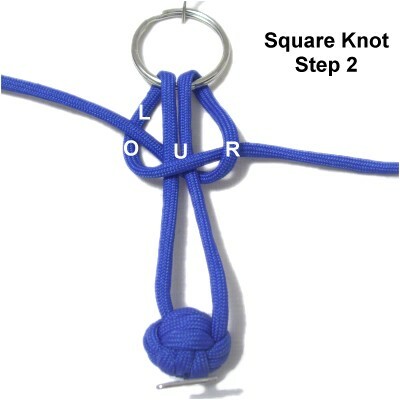 Square knots are used to form a strap between that knot and the ring. 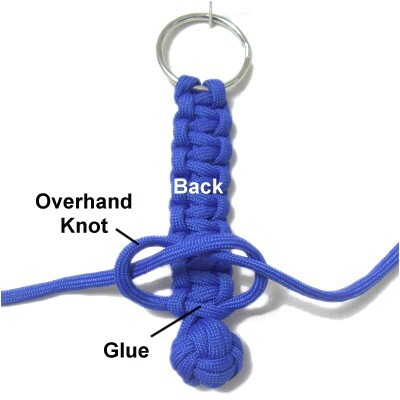 This is a good Macrame project for older children, teens and beginners, since few knots are used in the design. 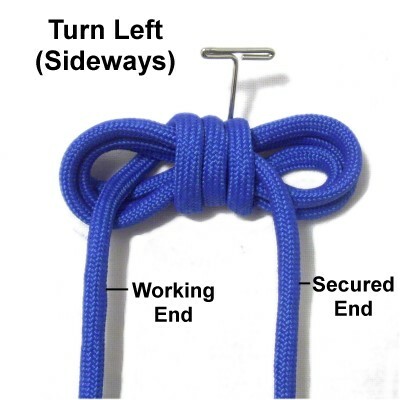 Tightening the Monkey Fist knot is challenging, so some children may need help from an adult. 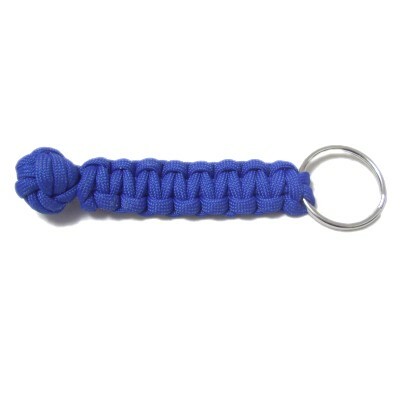 Any material can be used, but the nylon Parachute cord (Paracord) shown in the example makes this key chain very strong. It's also smooth and comfortable to hold. Cut 1 cord, at least 70 inches long. 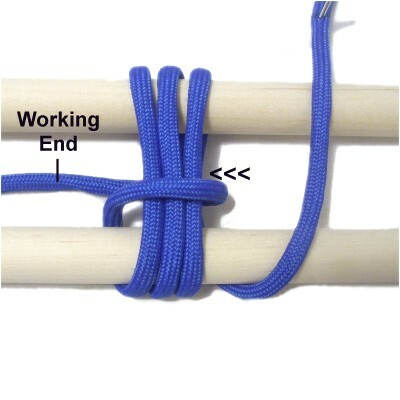 Prepare both ends by placing tape on the tips. 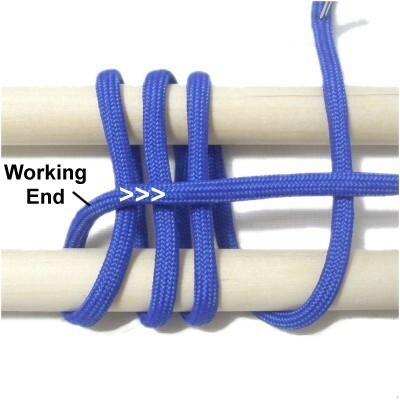 When using Paracord, an Adult should heat the ends to melt the outer sleeve around the inner core yarns. Visit Cord Preparation for more details by clicking on the link or image. The Paracord Preparation is near the bottom of that page. 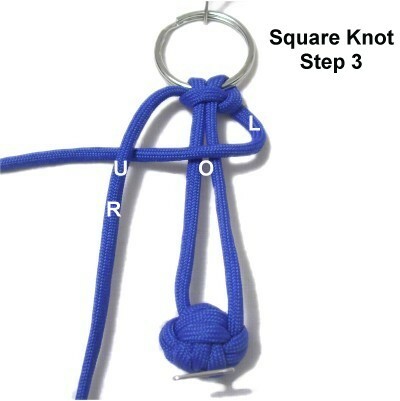 The instructions for the Monkey Key Chain have been changed so you now make the knot around two dowels, which is easier than fingers. So secure them to your board horizontally. Placing pins above and below them is usually enough, but you can also use tape or rubber bands. There should be between 1-inch to 1.5 inches apart. Mentally label the two dowels (front versus back). The front dowel is closer to the front of your board. Step 1: Measure 25 inches from one end of the cord. Secure that segment near the back dowel on your right. Wrap the remaining material (working end) around both dowels three times, moving right to left. When you are through, bring it between the two dowels. Designer's Tip: Do not count the 25-inch segment (secured end) as one of the wraps. Move it off to the side if that helps. 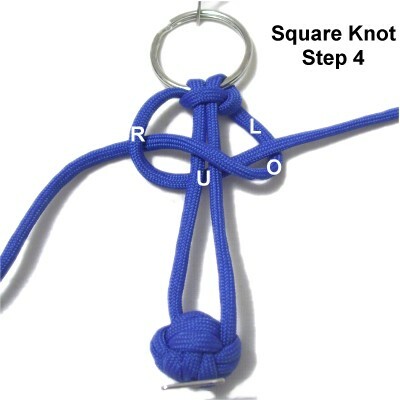 It's important that there are exactly three segments in each area of the Monkey Fist knot, so it's balanced. Step 2: Bring the working end to the right, resting on top of the three wrapped segments. This should take place close to the front dowel. 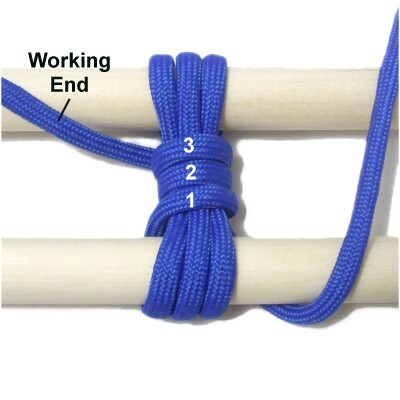 Bring the working end to the left, passing under the lower portion of the three wraps. Do not wrap around the secured end. Repeat the same process 2 more times, wrapping towards the back dowel. When you are finished, the working end should be on the left. Step 3: Pass the working end under the three segments that rest around the BACK dowel, from left to right. Step 4: Remove the dowels carefully. Release the secured end, and position it forward (towards you). Turn the knot to the left sideways. Both ends should be heading forward, with the working end on the left. Step 5: Bring the working end across the front of the wraps you made in step 2, left to right. Pass it under those segments as you bring it back through the left space (not shown). Wrap a total of three times, heading forward, so the last wrap is closest to you. Make sure the working end is on the left when you are through. Step 6: Tightening this portion of the Monkey Key Chain is the most challenging step. The numbers on this image indicate the order in which the wraps were made. They should be tightened in that order. Be sure to read the tips below BEFORE getting started. The first set of wraps are tightened first. They are the loose ones on the right and left (labeled 1 in the image above). Pull on the secured end to determine which loop to tighten first. The best way to tighten is to start by pulling gently on the loose one. Observe the wraps directly opposite to see which segment moves. Once you've found the correct segment, pull it firmly to tighten the loose one completely. It's really hard to go back a second time to remove slack from segments that were not tightened enough. Gradually push the Monkey Fist into a round shape, particularly when tightening the second and third set of wraps. Step 7: The next part of the Monkey Key Chain is the strap. Arrange the Monkey Fist close to the front of your board, with the ends heading towards the back, as in the image above and below. Pass both ends through the ring, entering into it from the top. 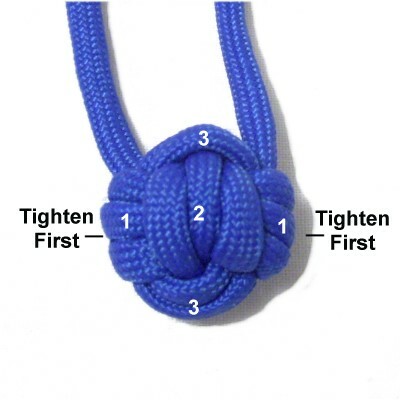 Move them forward, towards the Monkey Fist knot. The working cords for the Square Knots are on the outside. The portion between the knot and the ring act as fillers. 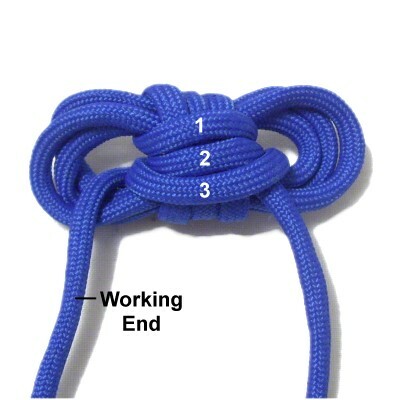 Adjust the placement of the knot, so it rests 3 - 4 inches from the ring. Secure the knot and the ring. Step 8: Move the left working cord to the right, passing over the fillers and under the right working cord. Move the right working cord to the left, passing it under the fillers and over the left working cord. 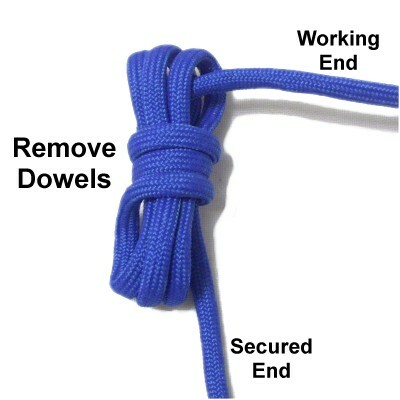 Pull both cords to tighten the first half of the Square Knot. The working cords have now switched places. Step 9: Move the left working cord to the LEFT, passing over the fillers and under the right working cord. Move the right working cord to the RIGHT, passing it under the fillers and over the left working cord. 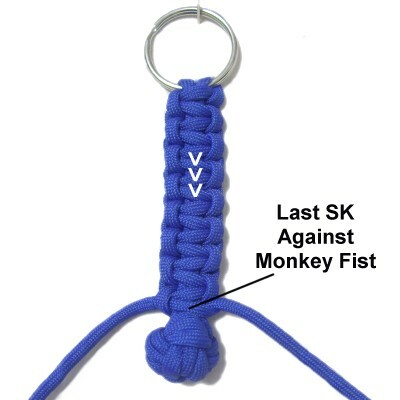 Pull both cords to tighten the first SK for your Monkey Key Chain. 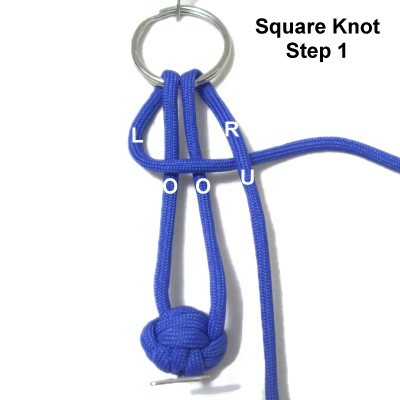 Step 10: Tie several more Square knots to complete the strap for the Monkey Key Chain. Push the knots close together as you progress. 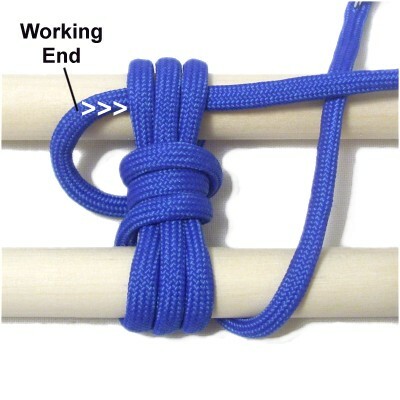 The last knot tied should rest against the Monkey Fist knot. Step 11: Turn the Monkey Key chain upside down so you work in the back of the strap. 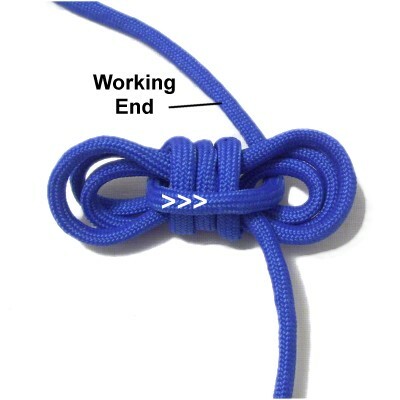 Tie a very tight Overhand knot with the ends. As you tighten it, apply glue on the inside, and on the last SK where it will rest. 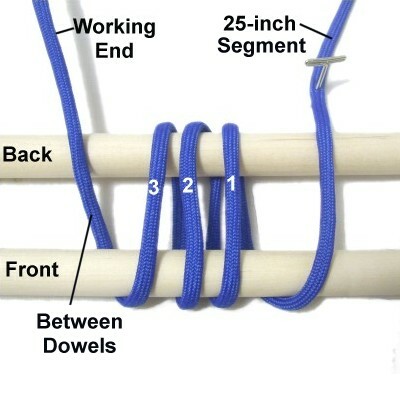 Step 12: Pass the ends under a loop to hold them in place. Cut off the excess material and apply more glue if needed. 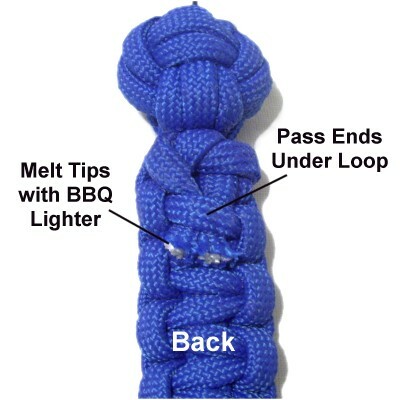 Melt the tips with a BBQ Lighter if using Paracord (or other material that can be melted). Have any comments about the Monkey Key Chain? Contact Me.